I must be hardwired to automatically gravitate towards flashlights and tools as I have not outgrown my fascination of lights and Swiss knives. Fact is, I can spend looking at catalogs for hours just to be fascinated and awed by what technology is available. Notwithstanding the high tech, one of the things I miss in the newer stuff is durability. I guess ever since planned obsolescence entered the lexicon of consumer electronics, you can only expect stuff to last for so long. Sometimes, it's just too short for comfort. As a contrast, I've had two Maglite Solitaires that lasted like 15-17 years (one got lost, another had the tailcap permanently bonded to the body but otherwise was still working until the battery power ran out) so when the Fenix EO5 I got from Tactical Asia last year lasted a mere three or so months, I went out on a limb and looked for the LED version of the Solitaire. However, Hahn-Manila, the official Philippine distributor, still hasn't carried it years after Maglite finally gave in to LED tech most probably due to the low demand. So I looked online and found a few sellers but the prices (upwards of P900) were a bit steep vis-a-vis the lumens (37) and features (only one brightness mode). Perhaps, it was time to try another brand. NO MORE FENIX FOR ME. 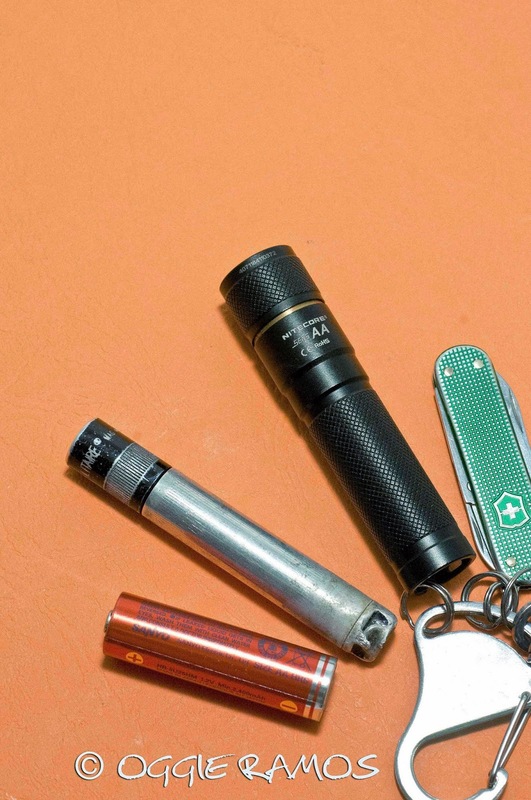 As a practice, I always have a flashlight attached to my keys along with a compact Swiss knife so you can say I felt bare having no EDC torch after my second Fenix just refused to light up. Getting another Fenix torch was out of the question as I've had two AA versions in the past two years and both lasted only a few months (the first, an EO1, had a battery leak issue). Funny thing, my other China-made, unbranded 4 AA flashlight was much abused during trips and is still going on strong. One thing apparent is I will have to settle for another China-made brand as almost all the brands are manufactured there anyway. It's fun and bewildering to research the flashlight forums and find all sorts of aficionados. While I can understand quite a bit of the tech specs jargon, I don't want to get carried away by the unbridled wanting for lumens and throw. I also certainly don't want to spend so much for a flashlight more so if it's going to be too big to carry on my key chain. Also, call me old-fashioned or old school, but buying from a physical store beats buying online any day as a physical inspection can reveal details that no online site can. TALKING SENS. Honestly, I wanted a downright simple torch with 2-3 brightness levels and some semblance of weatherproofing. Instead, what I got was a high-tech one. I've always read about Nitecore and even though I have no dreams of saving up for their 4000 lumens TM26 (wow!) or the TM36 with a 1100 meter throw (double wow! ), their technology absolutely fascinates me. Scanning what's available from the Tactical Asia site, the SENS series caught my eye. Small but bright (minimum 120 lumens for the AA version, max of 190 lumens for the CR123 version) - check. Really handy (3.2") and light (26grams) - check. Three brightness levels - check. Looks durable and well-sealed (fingers crossed here though the SENS AA is rated submersible up to 2 meters; the aircraft aluminium body is thick and appears robust). NEW ANGLES ON LIGHTING. I must admit, I wasn't hot about the Active Dimming Tech at first (maybe a nice feature to read about but could be useless). The principle isn't at all complicated -- it's accelerometer-based light adjustment much like what the mobile phones and tablet have been using for gaming. Point the flashlight straight up and it goes full blast (120 lumens) when pointed straight out horizontally parallel to the ground; tilt it some 45 degrees and it automatically goes to medium (20 lumens). Tilt it straight down and it goes to low (6 lumens). 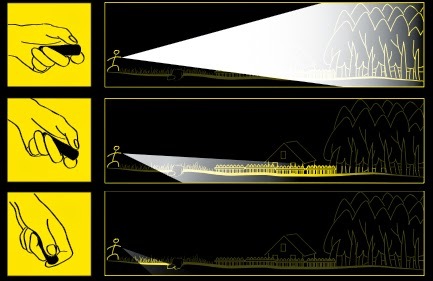 To go directly to high (120 lumens), turn the flashlight on pointing straight out horizontally parallel to the ground; for medium, turn it on about pointing about 45 degree from horizontal; for low, open the torch pointed straight down. Not really hard to understand even without the benefit of the short product literature in the pack or the infographic online I've posted above. In real life, I found the automatic dimming practical as I would need less light for nearer tasks, more light for searching farther away. I also find the absence of a tactical tail switch a plus as the weather sealing could be better with essentially only two main parts, the head and body. I was wondering if it came with a reversible clip, it could function as a automatic dimming headlamp when attached to a cap, eyeglasses or goggles. In practice, the ADT in my torch doesn't work all the time though that doesn't take away anything from this so far, wonderful, piece of intuitive light tech. I also appreciate that when the ADT works, the adjustment is gradual to allow my eyes to adjust (some people may find the lag a minus but I like it). SENS AA OR CR? The CR version is even smaller than the AA at a little over 2 inches long and 70 lumens brighter (the Mini is the smallest owing to the smaller CR2 battery though the runtimes are the least impressive of all three versions available). It was tempting to get the CR though on hindsight, the CR123 battery isn't commonly available especially out of town, ditto the CR2. They're also more expensive where you can find them (some camera shops do carry them) so picking the SENS AA was a sensible decision on my part. No sense having a bright flashlight on the ready when you can't buy a replacement battery when you're out there. The slightly longer body (3.2" vs. 2.52") also makes the AA easier to handle. The knurling is not too aggressive as I've read in the forums and makes the smaller CR version a bit more difficult to handle and twist with one hand. I've read some forumers grumble about the styling but I like the no fuss, minimalist styling, matte black anodizing nicely accented by a brass ring. RUNTIMES. At 60 hours at 6 lumens (low) or 12 hours at 20 (medium), I guess the circuitry is very energy efficient. With Napocor already announcing rotating brownouts for the coming summer, this feature is gonna come handy. FLOOD VS. THROW. Without getting too techy, I was also torn between a more far-reaching torch (light throw) vs. a more filling light (flood) and at 53 meters, I'm okay with the SENS AA as the next Nitecore AA model available within the price range was the 180 lumens MT1A with double the throw (115 meters). However, the latter is a full inch (4.3" vs 3.2") longer and double in weight (55 vs. 26 grams) which count a lot when it goes into my key chain for real, honest-to-goodness everyday carry and use. WILL IT LAST? I sure hope so so I can write a future review that even among made-in-China products, there are brands better, more durable than the others. I certainly don't expect it to last anywhere near my Maglite Solitaires but hopefully they even manage half the lifespan. Only then will I know if the SENS series do make sense, durability-wise. Flashlight fanatics yearning for a technical review can read Selfbuilt's comprehensive lowdown here.